Several recent reports have described osteonecrosis of the jaws (ONJ) associated with the use of bisphosphonates. Rheumatologists treating bone diseases with bisphosphonate need, therefore, to be aware of this potential risk and plan the prophylaxis, early diagnosis and prevention of potential consequences. We review the literature on this newly described complication, with particular focus on systemic and local predisposing pathologies, preventive measures suggested before and during therapy with bisphosphonates, and the most frequent clinical presentation of the oral lesions. The expert panel recommendations for the management of care of patients who develop ONJ are summarized. Bisphosphonates are becoming increasingly important in the treatment of metabolic and oncological diseases involving the skeleton [1–3]. These carbon-substituted pyrophosphate analogs are potent inhibitors of osteoclast-mediated bone resorption. The most recent nitrogen-containing bisphosphonates, or aminobisphosphonates, have greater potency and better selectivity; the most commonly used aminobisphosphonates include alendronate, risedronate, ibandronate, pamidronate and zoledronate. Alendronate, risedronate and ibandronate are used for the prevention and treatment of osteoporosis, while pamidronate and zoledronate have an essential role in the prevention of bone complications and the treatment of severe hypercalcemia associated with multiple myeloma or bone metastases from breast and prostate cancers [2, 3]. Generally, these drugs are well tolerated, rarely inducing clinically significant side effects: gastrointestinal symptoms for oral bisphosphonates (alendronate and risedronate); elevated serum creatinine, transient low-grade fever, arthralgias and increased bone pain for the injectable drugs (pamidronate and zoledronate) . However, recent reports have described osteonecrosis of the jaw bones (ONJ) as a potentially serious complication of the long-term use of these drugs [5–7]. In this condition the bone tissue in the jaw fails to heal often after minor trauma, such as a tooth extraction, leaving the bone exposed. To date, the majority of cases of bisphosphonate-associated ONJ have been reported in the oral surgical or oncological literature. This complication has been mainly reported in patients receiving intravenous pamidronate and/or zoledronate for multiple myeloma and bone metastases from breast cancer. However, some considerations suggest that increased awareness about this problem among rheumatologists might be useful for informing patients and for preventing this severe localized necrosis. First, an increasing number of cases of bisphosphonate-associated ONJ have been reported in patients taking an oral bisphosphonate (alendronate or risedronate) for osteoporosis or Paget's disease [7–13]. Second, zoledronate, the most potent aminobisphosphonate and the one most frequently associated with ONJ, has also been recently proposed for Paget's disease [14, 15] or osteoporosis . Third, even though at present bisphosphonate-associated ONJ seems to be a rare bisphosphonate-induced complication, the number of cases described has risen in the past three years. This may be due to our increased awareness about ONJ but a correlation with the total dose of bisphosphonate accumulated in the bone has been suggested ; in both cases the incidence will rise further in the next few years. Finally, since no effective therapy for bisphosphonate-associated ONJ has yet been established, it is vital to do everything possible to prevent it. Rheumatologists using bisphosphonate to treat bone diseases need to be aware of the potential risk of their patients developing ONJ. The most widespread clinical picture heralding the onset of bisphosphonate-associated ONJ is failure to heal, or slow healing, of bone after extraction of a tooth or other local oral surgery (70% to 80% of cases) [7, 9, 17, 18]. In the early stages there is no radiological evidence and the patient often has no symptoms; pain usually indicates a superimposed infection on the exposed bone. In 25% to 40% of cases ONJ arises spontaneously, not related to any particular trauma [9, 18]. In these cases the most frequent initial symptom is an unpleasant sensation in the mouth (numbness, paresthesia and burning sensation), with gradual changes to the mucosa, progressing to ulcers that are sluggish to heal. Pain may be strong, and is usually caused – as we said above – by super-infection of the necrotic bone, due to the oral bacterial flora. These signs and symptoms may precede the clinically evident onset of ONJ, and it is essential to recognize them so as to take all possible preventive measures (see below). ONJ is a progressive disorder causing extensive exposure of the maxillary or mandibular bone, with sequestration. The mandible and maxilla are normally the only bones involved in bisphosphonate-induced osteonecrosis, the most common site of exposure being the mandible in the area of the molars (about 70% of cases), followed by the posterior maxilla (about 30%); only few cases occur simultaneously in the mandible and maxilla . Involvement of the maxilla is a notable difference between bisphosphonate-related ONJ and osteoradionecrosis, a form of osteonecrosis secondary to radiotherapy for head and neck cancer that affects the mandible in 95% of cases . Before starting bisphosphonate therapy, a scrupulous search for systemic and local predisposing factors is essential. The most important predisposing factors for the development of bisphosphonate-associated ONJ are the type and total dose of bisphosphonate, but other predisposing or precipitating factors have been suggested: a diagnosis of cancer, a history of trauma or dental surgery, poor oral health, dental infections and the presence of mandibular tori [9, 20–23]. Corticosteroids and chemotherapy have been suggested to be associated with additional risk for ONJ but their specific contribution should be addressed in properly designed studies [21–23]. Of particular interest in terms of prevention is the knowledge that invasive dental procedures, such as removal of a tooth, periodontal surgery and dental implant placement, have been related to ONJ in more than 70% of cases [7, 9, 17, 18]. The first extensive reviews of bisphosphonate-related ONJ were published in 2003 by Marx, with 36 cases . Since then, a study of 63 cases by Ruggiero and colleagues , and others by Bagan and colleagues (10 cases)  and Marx and colleagues (119 cases) , together with many small series and case reports, have provided additional information on the features of ONJ [8, 10, 11, 13, 17, 18, 25–38]. The complication was never encountered in clinical trials prior to marketing pamidronate and zoledronate. In 2004 Novartis, the manufacturer of both these drugs, issued post-marketing guidelines regarding ONJ . Although ONJ is considered an uncommon bisphosphonate-induced complication, a recent worldwide web-based survey evaluating its incidence in 1,203 patients receiving intravenous bisphosphonates for myeloma (904 patients) or breast cancer (299 patients) found definite or suspected ONJ in 12.8% of myeloma patients and 12% with breast cancer . In these patients, after 36 months of bisphosphonate treatment, the estimated incidence of ONJ was 10% among patients receiving zoledronate and 4% among patients receiving pamidronate. The risk of developing ONJ for patients taking alendronate, the most commonly prescribed oral bisphosphonate, has been estimated to occur in approximately 0.7 per 100,000 persons per years' exposure ; on the other hand, the incidence of ONJ for risedronate and ibandronate cannot yet be quantified because too few cases have been reported (12 cases for risedronate and one for ibandronate) . The duration of bisphosphonate therapy was one of the major risk factors. Bamias and colleagues  and Durie and colleagues  reported that patients treated with a potent bisphosphonate for more than 12 months were at highest risk of ONJ; the incidence rose with exposure to the drugs. Between 1998 and 2004 the Research on Adverse Drug Events and Reports (RADAR) investigators identified 561 cases of ONJ in cancer patients taking zoledronate ; 126 additional cases of zoledronate-related ONJ have been reported in the literature from 2005 until now [8–10, 12, 13, 17, 18, 24–33, 35, 36]. From 2003 until now (March 2006) another 261 cases of ONJ have been described in the literature, 141 of them receiving only pamidronate [6–13, 17, 18, 24, 26, 31, 33–38], 101 pamidronate and zoledronate [6, 7, 9, 10, 12, 13, 17, 18, 21, 24, 25, 30–33, 36], 21 aledronate [7–13], 1 risedronate  and 4 combined therapy (1 alendronate, pamidronate and zoledronate; 1 zoledronate and ibandronate; 1 alendronate and zoledronate) [7, 21, 27]. It is still not clear which patients are at greatest risk of ONJ. The complication has been mostly reported in cancer patients treated with intravenous bisphosphonate. Therefore, malignant diseases and a history of systemic chemotherapy are considered the most significant comorbidities. However, patients with ONJ unrelated to cancer have been reported too: 19 patients with osteoporosis (17 receiving alendronate, 1 risedronate and 1 alendronate and zoledronate) [7–10, 12, 13] and 9 patients with Paget's disease of bone (4 receiving alendronate, 4 pamidronate, 1 pamidronate and alendronate) [8, 11, 12]. However, this is probably an underestimation of the cases of ONJ associated with oral bisphosphonate. In fact, in a recent review from the American Dental Association  the total number of reported cases of possible ONJ associated with oral bisphosphonates was 170 worldwide for alendronate, 12 for risedronate and 1 for ibandronate. Although the specific causal relationship has yet to be established, the correlation between bisphosphonate therapy and osteonecrosis appears strong. The specific mechanism is not known but several pathogenetic factors seem to be operative. Bisphosphonates prevent bone resorption by inhibiting osteoclastic activity through different mechanisms: inhibition of osteoclast development from monocytes , increased osteoclast apoptosis , prevention of osteoclast development and recruitment from bone marrow precursors , stimulation of osteoclast inhibitory factor , and reduction of osteoclast activity through an effect on the cell cytoskeleton . In addition, anti-angiogenetic properties have been recently described for these drugs [46, 47]. The final result is a profound suppression of bone turnover and, with time, a reduction or cessation of bone remodeling. This brittle bone becomes unable to repair the physiological microfractures that are caused daily in the jaws by masticatory forces . The particular location of bisphosphonate-induced osteonecrosis in the oral cavity may be attributable to the exposure of these bone structures to the environment through the gingival sulcus, which may facilitate bone infection and progression to osteomyelitis [6, 9, 20, 48]. The particular structures of the oral cavity may explain why a large proportion of cases are associated with tooth extractions or other invasive dental procedures, when the risk of infections as well as the need for bone repair and remodeling are increased. Other pathogenetic factors may include concomitant therapy and/or associated pathologies. The histological examination of bone, usually performed to exclude metastatic bone disease, revealed necrotic bone with inflammatory changes and bacterial superinfection [7, 17, 32]. The realization that ONJ could be the product of the loss of osteoclastic bone remodeling and renewal in the presence of physiological stress, local trauma or tooth infections offers some indications on strategies for preventing it. We are not yet able to predict which patients are prone to ONJ and at present there is no definite treatment for this complication. This means preventive measures are of paramount importance. Recommendations for the prevention, diagnosis and treatment of ONJ in cancer patients receiving intravenous bisphosphonate therapy were developed by an expert panel assembled by Novartis  and then by the American Academy of Oral Medicine  and the American Academy of Oral and Maxillofacial Pathology . 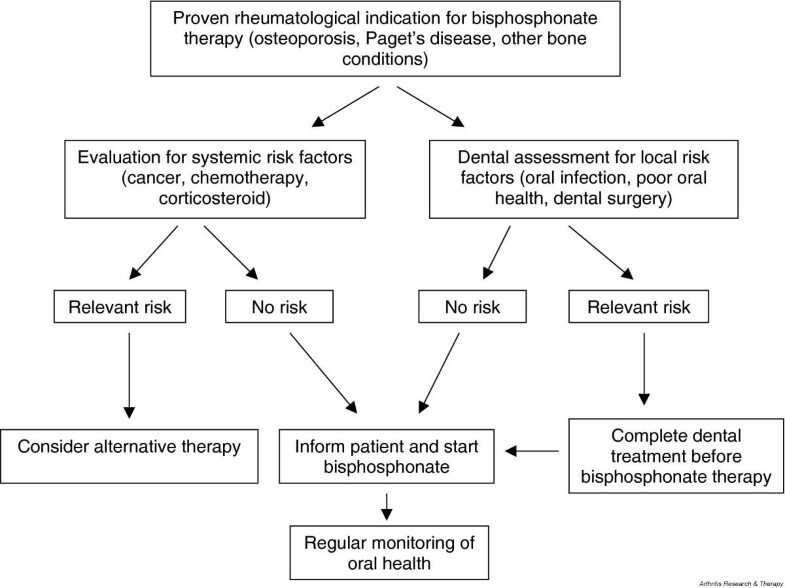 Of particular relevance for rheumatologists are the recently developed expert panel recommendations for dental management of patients receiving oral bisphosphonate therapy . The rheumatologist should inform the patient of the usefulness of bisphosphonate therapy for the prevention and treatment of osteoporosis or Paget's disease of bone. At the same time the patient needs to be aware of the potential but very low risk of ONJ and its possible prevention (Figure 1). A screening oral evaluation and history for local or systemic risk factors for ONJ should be carried out by the rheumatologist, or by the dentist if needed, before therapy with bisphosphonate or as soon as possible after beginning therapy. Any tooth extraction or surgical procedures should be completed before bisphosphonate therapy with enough time allowed for healing. The risk-benefit profile for each individual patient should be considered before starting long-term bisphosphonate therapy, and if there are any systemic or local risk factors for ONJ (see above) an alternative therapy should be considered, at least when possible, such as for post-menopausal osteoporosis: estrogens, raloxifene, strontium ranelate, teriparatide (reviewed in ). Furthermore, clodronate, an orally or parenterally administered first-generation bisphosphonate, widely used in Europe with no reports of associated osteonecrosis, should also be considered . Preventive strategy to identify patients at risk of developing bisphosphonate-associated osteonecrosis of the jaw. Since the elimination of all potential sites of infection is the primary objective , patients already receiving bisphosphonates must be informed of the best ways to maximize oral hygiene, and regular dental inspections of oral health should be scheduled. Since ONJ is more commonly associated with dental procedures that traumatize bone, in these patients endodontic therapy is preferred to tooth extraction and invasive periodontal procedures or dental implant placement should be avoided [20, 40]. If these procedures cannot be postponed, the rheumatologist must give the dentist or maxillofacial surgeon clear information on the patient's bisphosphonate therapy, so as to plan the dental treatment to take it into full account and implement preventive measures to avoid ONJ. At the same time, the patient should again be informed about the potential but very small risk of developing ONJ. The onset of ONJ calls for immediate contact with the dental specialist to agree on a course of action. As we said, there is no definite therapy so complete resolution is usually not possible. However, some therapeutic approaches have been proposed, at least to restrict the necrotic area [9, 20, 31]. The goals in a patient with ONJ are, of course, to relieve the pain, but primarily to control secondary infection in the necrotic area; this means abstaining – as far as possible – from dental surgery so as not to enlarge it. Daily topical antimicrobial or anti-inflammatory agents (for example, chlorhexidine gluconate rinses three to four times a day) are recommended. If local infection is suspected, or confirmed by culture, aggressive systemic antibiotics should be started, ideally – unless the antibiotic sensitivity test indicates otherwise – with penicillin-type antibiotics or doxycycline in penicillin-allergic patients [9, 20, 31]. Unlike in radio-osteonecrosis, hyperbaric oxygen has not given encouraging results in ONJ patients [7, 9, 20]. The utility of stopping the bisphosphonates has not been proved either. The long bioavailability and systemic uptake of the aminobisphosphonates  seems to make it pointless to withdraw them once a patient clearly has ONJ [9, 17, 20, 29]. However, it has been suggested that it might be useful, when feasible, to stop the drugs for several months in patients who absolutely require local oral surgery [12, 26, 34, 36]. ONJ is an emerging problem in patients taking long-term bisphosphonate therapy. Even if the use of zoledronate and/or pamidronate in cancer patients is a major risk factor for ONJ, an increasing number of cases of ONJ in patients taking oral bisphosphonate (alendronate, risedronate or ibandronate) for osteoporosis or Pagets' disease have been described. Even if the number of cases of ONJ in patients taking oral bisphosphonates are still rare compared to the total exposure, rheumatologists treating bone diseases with bisphosphonates need to be aware there is a small risk their patients may develop this new complication, allowing for prophylaxis, early diagnosis and prevention of potential consequences. The benefit/risk of bisphosphonate therapy should be individually discussed and, when necessary and possible, alternative therapy for postmenopausal osteoporosis should be considered. The need for the patient to be dentally fit and to maintain this state forever should be part of the informed consent for bisphosphonate treatment. If until now it has been uncommon or unnecessary for rheumatologists to ask about dental problems of their patients, this new bisphosphonate-associated complication highlights the need for this to change. = osteonecrosis of the jaws. This work was supported by research funds FIRST 2005 (University of Milan).